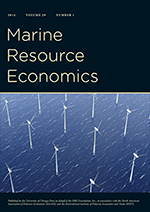 The Environmental Economics blog is dedicated to the dissemination of economists’ views on current environmental and natural resource issues. We hope this blog will help bring economists’ views on environmental issues further into the mainstream. The intended audience includes the general public and students. Posts are non-technical. "The right wing always suspects you of being a tree-hugging environmentalist and the left wing accuses you of being a money-grubbing capitalist." Source: WSJ. Is Efficiency vs Equity a Fair Fight?